Maybe thats what the bones for the “get naked” sign resulted from. I totally understand if it’s not on the path you’ve chosen, but I’m hoping you plan to meander through Idiotville, a city which I just noticed is kind of on your way. Guessing it once said “Map,” and got paved over? Still, after that bone sign, best to move along. That was my thought, map got paved over. I believe you are on the right path! It does appear the left portion has been paved over. But still – Nap + area = bone sign, maybe? Just keep steppin’ right along … your nap will be on the beach at Rockaway Beach … of course there’s the issue of cheering crowds and requests for autographs … but that’s another day! The toy slayer continues. I saw him mark this a couple days ago. Resist the urge…do not eat the apples, do not take a road nap….you will look like all those animals that nap on the side of the road..or at least that is what we tell the children……. I just checked Google Maps from where this pic was taken and it looks like Matt should make it to Rockaway Beach before the end of the month. Make sure the Mattmobile is on even ground. No naps for now. Keep walking and stay safe! Love it, Jeff, haven’t seen that toy slayer lately. What happened to all the beetles did you eat ’em all, already? Did you not spare me half a bee, even? Not even for a hobo walker… hope you found another nice family to be w/ tonight… where you can nap safely! You’re finding some unusual things there. No naps or you’ll be spelled out like those bones. Road crew put up safety orange cones as specified when working along roadside. The day was hot, so about midday they stopped for lunch. One of the workers (no name mentioned because of job security) decided to have a beer instead of water. In fact, he had hidden in his lunchbox 3 beers! And he was so hot, and so thirsty he drank them all! Decided he needed to take a nap. Rest of crew finished their work, picked up the cones and left for the next job miles up the road. BUT, what to do about “un-named crew worker” who was deep into a beer induced sleep? Hmmmm….hence they did their best. 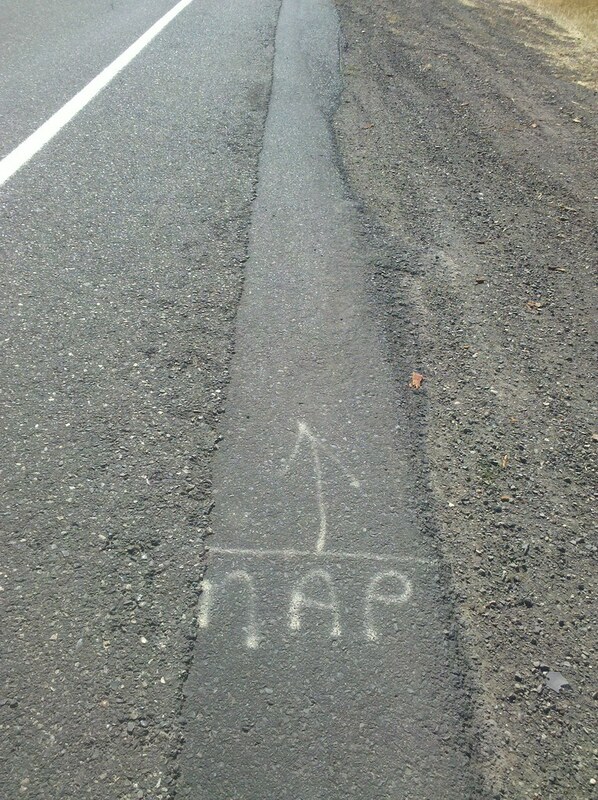 They wrote nap on the road with an arrow pointing to where he was sleeping. I am sure by now the “un-named” worker is home, showered, and telling the family how hard he/she worked over a lovely dinner. Maybe? I mean, what else could nap on the side of the road mean? And you must admire the rest of the crew, always thinking of safety. wow, we all know that matt’s a ramblin’ man, but @Karin, that was REALLY ramblin’ !! I like your story/theory best! I’d stick with that. On a side note; is the progress map not loading for anyone else this morning? Matt, you are so close to your goal – Unless you Nap or take a rest break – less than a week away?!?!?! Unless I’m counting those miles incorrectly. Woohoo! Go Matt, Go! From a couple postings I’ve read, it looks like it won’t be straight shot to the coast. I’d guess we’re looking at Sunday or Monday. nap = Next Adventure, Portland! Day 51: Burger King is selling bags of ice? !